Without a comprehensive, systematic and interconnected understanding of the nonlinear system formed by the atmosphere, the oceans, the land mass and the biosphere, dogmas like those of a man-made, CO2-mediated global warming can only be pushed forward as part of a political and media-driven agenda. With a functional, comprehensive understanding, these dogmas are shown to be worth no more than a child's chimeras. If there were really a majority consensus that global warming is real and man-made, then one would have to conclude that it was the consensus of a majority of infantilized adults - not scientists capable of thinking by themselves and applying the scientific method, but mass-conditioned zombies vying for technobureaucratic jobs. So, one must ask - what is it that these pseudo-scientists are hiding when they sell their globally warmed sausages or their smelly fish? They are hiding the real climatological change now under way: the increase in aerosol particulates, including the sulphur and nitrous oxides from coal burning (sources of so-called acid rain), and the aromatic or cyclical particulates of diesel, gas and oil burning, which engage a new atmospheric chemistry whose end products are low-level concentrations of ozone and the trapping of water vapor and carbon monoxide near the ground. This phenomenon has been called 'smog', but this term, too, was the product of a fad that reduced the phenomenon to the presence in the air of carbon or soot - in reality only one of the particulates in question. The designation 'smog' is no more adequate than is the myth of 'global warming'. Indeed, what open-minded scrutiny presents to us is that certain effects of atmospheric systems have intensified; but these systems cannot be judged from the human catastrophes they generate, since global urbanization and explosive demographic growth alone have contributed to the intensity of these catastrophes, as hurricane Katrina so poignantly demonstrated (unbridled urbanization of low level river, lake and sea shore areas obviously vulnerable to cyclonic systems and sea level changes). They must be examined by looking at the data (the rates of precipitation, wind speed, concentration of particulate types, etc), and by critical consideration of this data - which is neither homogenous nor certain in a variety of technical senses. The intensification of the parameters of both cyclonic systems (the strength of hurricanes, the frequency of high-strength hurricanes, the electric potential of thunderstorms, the non-discharging condition of rainstorms, the extremes of heat and cold for hot and cold fronts, etc) and anti-cyclonic systems (the trapping of free-radicals and humidity that turns sunny days into 'smoggy' or 'helmet' days, the distinct types of 'anti-cyclonic days' ), can be directly connected to the emergence of an altered atmospheric 'metabolism', an altered energy process and an altered air chemistry. We have in fact argued that this altered metabolism is not simply due to the chemical properties of free-radicals in the atmosphere, or their generation from a variety of particulate emissions; we have presented a variety of evidence (enthalpic balance of the allotropic cycle of the atmosphere , a new treatment of the Nernst equation that integrates acid-base and redox processes , a model for the emission of non-electromagnetic Tesla waves from electrons and protons , demonstration of absorption of Tesla waves or radiation by a variety of fundamental atmospheric molecules ) that shows that a massfree form of atmospheric electricity (ambipolar radiation) constitutes a significant variable which climatologists and physicists have steadfastly ignored to this day. Our work has identified the physical processes whereby acidified water (in the liquid or gas phase) and ozone can generate this radiation, but with properties that are biologically damaging and which promote the production of free-radical chemical species. One of the main consequences of this alteration of atmospheric physical and chemical processes, and the production of high-energy ambipolar radiation, is the trapping of latent heat by free-radical particulates, and its interference with the evaporative cycle of water that concentrates water vapour in clouds. All the observed climatological alterations now underway - oxygen-depleted anti-cyclonic systems, excess ground-level ozone, the dangerous over-heating of city environments, violent precipitation discharges from cyclonic systems, intensification of hurricane winds, desertification of the planet, etc, are related, in one way or another, to atmospheric alterations in the absorption and emission of ambipolar radiation. We were obliged to make a concise statement on what is the real man-made climatological problem under way, to explain to the reader that the problem is neither one of global warming, nor merely one of increased production of carbon dioxide. The problem is far more complex, and the ideology of 'global warming' merely reduces it to an ineffectual, marketable caricature of the issue. Secondly, there is little to argue against regarding the correlation made between the climatological change now underway and human activity, though there are also plenty of natural factors involved (reaction processes that may either increase or diminish the impact of these human activities). But global weather change cannot be defined by a dubious global increase in temperature, nor does it require such an increase in order to be real. Thirdly, it is obvious that the burning of fossil fuels is one of the major polluting process contributing to the climatological change now underway - coupled with tropical deforestation, rampant urbanization, nuclear explosions and emissions. But what man-made pollution fundamentally contributes is a carcinogenic chemistry of free-radicals, with the noxious radiations (electromagnetic and non-electromagnetic) attendant to it, and an altered atmospheric metabolism of water, oxygen and latent heat - not a mere or necessary increase in temperature. Of course, the pseudoscientific consensus of the leftist ideologues of global warming does not restrict itself to marketing this fad: they want to do 'something' about the 'warming'. A demented posture, only deserving of more laughter. For, what do they mean by 'doing something'? One would think that, at the very least, they would mean to be part of the solution; but in fact they are literally scrambling to be part of the problem - and the reason is that the solutions they propose are not solutions at all, but bureaucratic and regulatory nightmares. With no underlying interest in, nor commitment to, the development of alternative energy technologies, these "solutions" constitute instead a veritable power grab on the level of the new technocratic planetarian order. In fact, we ourselves have experienced a most poignant and consistent disinterest in our innovative energy technologies on the part of such highfalutin' organizations as WWF, Greenpeace, Save the Planet, and so on. One might think that people and organizations like these - WWF, Greenpeace, etc - would at least be sufficiently open-minded to explore the possibility of new physics, paradigm changes that might open the doors to innovative alternative energy technologies which could bring to an end the era of fossil fuels and oil-dependency, or the alternative dependency on nuclear fission. But no; in our experience, they are some of the most destructive and rabid enemies of alternative physics and energy research. A typical example is that of William M. Connolley, a minor zealot of global warming, who is also a self-appointed watchdog of the "purity of science" on Wikipedia, taking it upon himself to combat, with falsification and slander, any possible insertion into Wikipedia of accurate information about non-mainstream scientific developments - and this in areas of research in which he has not read a single scientific publication and of which he has no understanding whatsoever. But all this should come as no surprise - as these people are, for the most part, in the pay of bureaucratic, political and corporate interests which have seized the ecological and climatological catastrophe as the latest commodity they should sell and regulate; most are either leftist militants, technobureaucrats with government paychecks, or employees of polluting industries - ecologists in Exxon's pay, and so on. 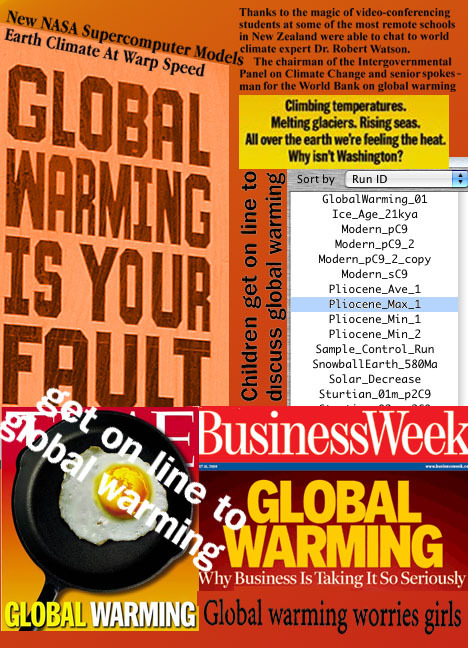 British Petroleum, for instance, has now become a major subscriber to the fiction of global warming. And they've put the myth to some use in their August 2005 commercial campaign as a justification for their (mythical) switch towards 'a hydrogen economy', as if such an economy were viable and did not specifically rely on the employment of fossil fuel for the generation of hydrogen... Smooth falsities, made even smoother. So why on earth would they want to know about alternative energy from nuclear fusion, solar ambipolar radiation, or the proscribed Aether? The new manufactured consensus thus stands revealed as a grievous pseudo-scientific myth, one with no other use than the politics of globalization - for the benefit of the new capitalists and technocrats of international order - and one which requires a systematic policy of suppression of scientific and technological innovation. Its science must be magical, just as its global consensus is magical. The last underpinning of the dogma of global warming is one that its defenders seldom put forth, but that is contained in the current policy statement of the American Meteorological Society - that "global warming" does not necessarily mean warming at all... but "all the climate and environmental effects arising from natural climate variability (!!) as well as from anthropogenic changes in atmospheric composition and land use". With this ridiculous definition, global warming could literally mean anything and everything, including the authors' model of increasing free-radical particulates and their ambipolar radiative properties. Acid rain would be "global warming", even global cooling could be global warming... Why not? The magik of global capitalism, and the magik of Science, with its 262 affiliated societies and academies of science - the largest peer-reviewed journal in Die Welt. Little wonder, then, that the informed public does not give a hoot about science - about the science of the establishment, mainstream science, Official Science. And no wonder, too, that so many official and officiating scientists and science journalists do not mind to bend the truth to eke out a living. They know that Official Science is like the media - it's all about catchy shades of the false, distortion of facts, the infilling of data - about packaging. About the spectacle of the Big Warming, the succession of fads and their impoverished cycles. They have found an outlet for their mediocre creativity, and they are being paid to 'express themselves'. It is the circus of Big Science; it is Knowledge Warfare, the rule of the mediocracy. It is Kyoto as merchandise, basic science as the target to mow down, and any real technological solution to the global energy crisis as the casualty. And 'they' have 'peer-review' to prove that they are right, that they are... scientific.